Susan Fletcher’s new novel is the seventh in a body of work that is mostly, but not entirely, historical. Since her prize-winning debut, Eve Green, with its contemporary Welsh setting, she has addressed a quirky range of historical subjects from a nineteenth-century French mental hospital in Let Me Tell You About a Man I Knew, to the aftermath of the 1692 Glencoe Massacre in Corrag. Past or present, the novels are linked by their deep emotional intensity, the way they employ myth and folklore, and by their beguiling, dreamlike style. 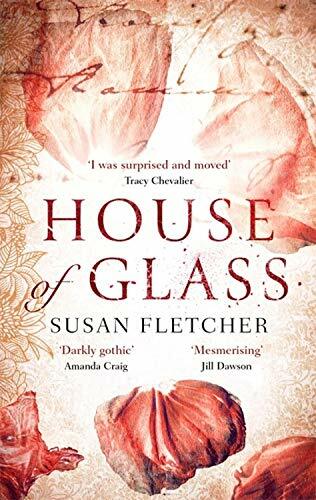 House of Glass occupies the historical gothic genre, which bestselling literary authors such as Sarah Perry and Natasha Pulley have brought back into vogue. 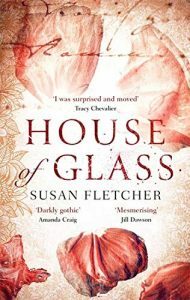 Its protagonist is Clare Waterfield, a young Edwardian woman set apart from society by a debilitating brittle bone condition that has left her curiously shaped and with a bluish tinge to the whites of her eyes. She’s recently orphaned (in the best gothic tradition), and it’s to exorcise her grief that, after an unofficial apprenticeship with the curator of the Palm House at Kew Gardens in 1914, she accepts a commission at Shadowbrook, a rundown country house in Gloucestershire, where the owner Mr Fox wishes her to fill his restored glasshouse with exotic plants. Shrewd, stubborn, outspoken, Clara’s first person voice dominates the narrative. She’s struck by the beauty of Shadowbrook’s grounds, impressed by doughty Mr Hollis and his team of gardeners who tend them, but senses immediately that all is not well in the house itself. Why is Mr Fox rarely in residence and why is she not permitted to meet him when he is? What causes the housekeeper, Mrs Bale, such anxiety and exhaustion? Why are the local villagers so critical of the Pettigrew family who once owned Shadowbrook, and particularly of Veronique Pettigrew, a beautiful woman whose independent behaviour was considered monstrous and whose body was buried in the orchard? Above all, what causes the strange noises Clara hears in the night, the tapping on doors and the footsteps, and what kills the flowers in their vases and smashes pictures? She’s determined to get to the bottom of these matters through rational enquiry, but finds herself stymied at every turn. Clara’s confusion extends to the men she meets. There is Kit, the brooding neighbouring farmer, over whom hangs rumours of philandering and violence; Matthew, the diffident, conflicted rector of the parish church, who is no match for Clara’s rationalist arguments; Mr Fox himself, cultured and enigmatic; charismatic George, the ghost-hunter brought in to investigate the ‘haunting’. None proves to be what he first seems. Susan Fletcher evokes the lushness of Clara’s world with sensuous prose. The Palmhouse at Kew is where ‘vines twisted on metalwork; condensation pooled on beams and, having pooled, dripped on my shoulders and the backs of my hands.’ The garden at Shadowbrook has ‘deep, fire-coloured’ flower borders and ‘a dark, thatched tennis pavilion in which the furniture had rusted’. Such description piles up like the greenery to rich cumulative effect. There are respects in which the author subverts her chosen genre by not delivering what is promised. Clara, in her relentless dismissal of the supernatural, topples all the gothic tropes that been so carefully set up and disperses the delicious brooding atmosphere. Whilst one applauds her search for truth, the loss of the romance is a shame. On the other hand, since the novel yields up its final secrets at the outbreak of the First World War perhaps a note of sombre reality is the only option.